Sometimes all a piece of furniture needs is a little makeover. I have been working with a client for several months now and have transformed their home from shades of golds and reds to soft, inviting and calm neurtrals. 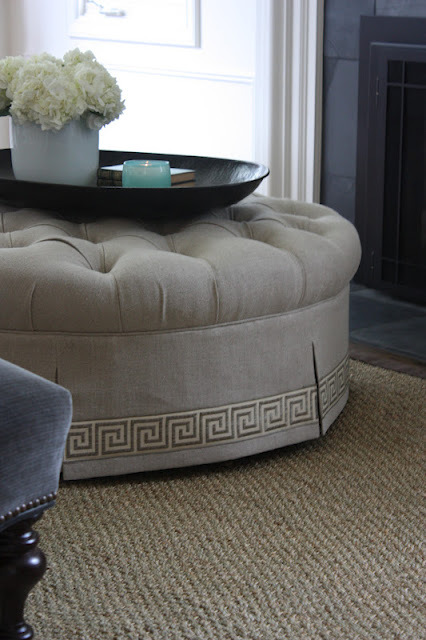 One of the pieces they had was a round tufted ottoman that simply needed a little makeover. The size was perfect for the space, but the colors and style were off. Instead of tossing it and buying something new, I suggested getting it reupholstered. It was in perfectly good shape and I knew I could transform it into a piece that would be absolutely perfect for their new design plan. This was how the ottoman looked when they hired me. It needed an update with more current fabrics and a new skirt style. Notice how tight the pleats on the skirt were. Here is what the ottoman looks like now! I chose a classic linen fabric with a chic Greek key trim to bring the piece up-to-date and fit with the new overall design concept. My upholsterer worked their magic and the result is exactly how I envisioned! Please note, I am not able to give sources to furnishings and accessories used in client projects as they hire me to create these spaces for them. Thank you for your understanding.